If you struggled using Emaze presentations on your phone, then I’m glad to tell you that Emaze released a new app for Android which will help you to enjoy emaze presentations from your Android phone. What can you do with Emaze presentation app ? View Presentations- watch many Emaze presentations easily. Share Presentations- send easily amazing Emaze presentations via WhatsApp, Facebook or Twitter to you friend, family and colleague. Explore Presentations- search presentations in any subject. All you need to do is to type a search term and watch the presentations in the category you like ! Why it’s better using Emaze app then Emaze mobile website? If you want to watch presentations of Emaze easily then you should use Emaze app. Watching Emaze presentation through Emaze mobile site or embedded presentations on other mobile sites might be difficult to you. 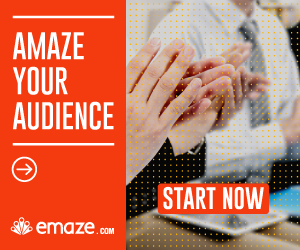 Emaze wants to make it easy for you to watch presentations. That’s why when you are watching presentations on a mobile site, you will see a link to download the app. If you decide not to download the app, you can still watch presentation through a mobile by rotating your phone screen. I think that it is very hard for Emaze technically to allow user edit presentation through the phone. But who know ? maybe they will surprise us !